Keynote speaker Dr. David Tranter, professor, co-creator of the Relationship Approach to Education and author of “The Third Path” will present from 5:35 p.m. for one hour. His presentation will focus on building strong and caring relationships, which, combined with well-being and academic success, can create the conditions for every student to flourish. More information about his work can be found at http://www.thirdpath.ca . This is a free event. 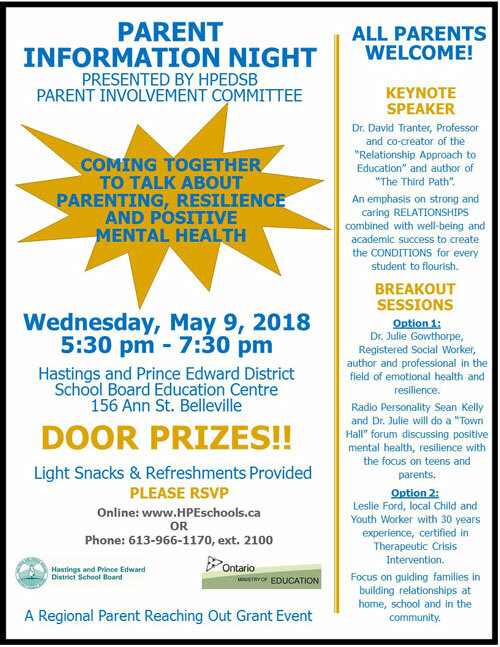 Please RSVP at https://sweb.hpedsb.on.ca:8005/registration/login.cfm  or call 613.966.1170, extension 2100.